TL;DR: audio hissing and slightly degraded video when on, perfect signal when wired incorrectly(?). Recently performed the 5V VRAM mod last year. Voltage appears to test fine everywhere. So I'd had enough of the BS my OEM power switch was giving me. I successfully installed an unused 5-11Under YPbPr component mod (love it! ), but the signal degraded more and more over time and was very touchy; I had to throw the switch in just the right way to get the ideal signal, and even then, it wouldn't last long. That's how I know it was the switch. I lucked out and found a DPST 6-pin slide switch at a local hardware store, slightly smaller than the original, but I made it fit with little problem. Plugged it in, the console immediately powered on. Threw the switch to on, it stayed powered on, with some audible hissing and somewhat degraded video. Threw it to off again... PERFECT SIGNAL. I mean, emulator quality picture and zero hiss. This time, the console powers on and off as normal, but I'm only getting the less-ideal signal and audio hiss. Looking closely, I can see very slight snow/static over the lighter-color graphics. It's almost like playing with the RF output, but with a sharper, more vivid picture. So what is going on? Why would the switch set in the bottom 4 leads give me the picture and sound I'm looking for? What is causing the degraded signal when everything seems to test ok? Is there a short I'm not seeing? Did you measure the AC voltage on those rails? So the bottom two pins (off position) are shorted to each other while the top pins are the "on" position. Every slide switch I've seen is compatible with that. You should see which pins are connected with the switch in each position. Anyway, with the video and memory mod, there's no reason for the 12V rail (except maybe for expansion modules). As a test, try leaving that disconnected. But my guess is that there is AC noise in one of the power rails. Yes, the rails both tested fine. I'm now wondering something, and maybe one of you can confirm this suspicion. Because I've tinkered with this switch enough times, I've pretty much destroyed all of the switch's traces on the topside of the motherboard, so I've been using hookup wire for the replacement. Again, voltage is fine...but what about current? I've been using 24 AWG stranded wire for this project, going from pin 3 (in your diagram) directly to L5, and pin 6 directly to L6, but maybe even 24 isn't thick enough? 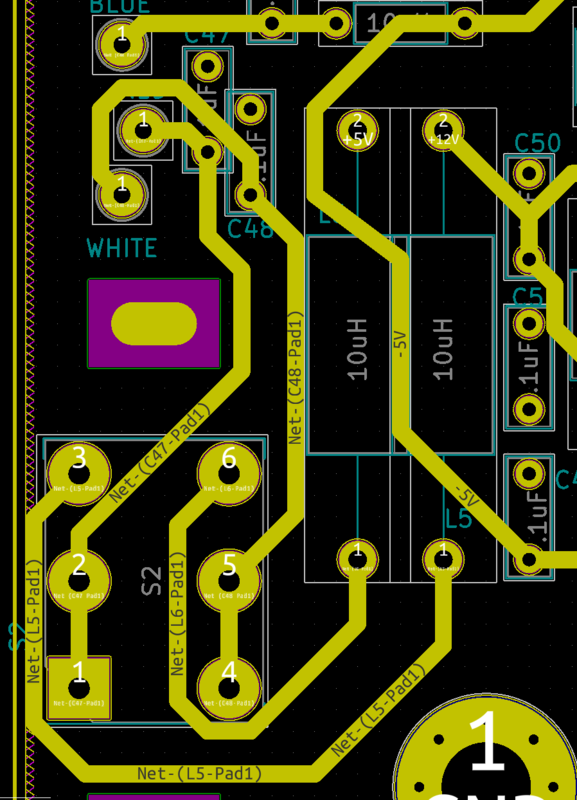 And another thing I'm coming to realize: the lifted trace going to L6 still had a good sized "hangnail" of solder on the end that I think was touching pin 5 of the switch when I went pin-to-pin the first attempt. With you saying that the 5v is all I need with the VRAM mod, that might explain why the console was on and working great with the switch in the off position--pin 5 shorted to L6 and was doing the same thing pin 6 is meant for. But with no impedance, thus perfect picture and sound! So am I correct in hypothesizing that I need a bigger gauge to connect pins 3 and 6 to the inductors? You still need 12v, even with 5v ram mod, for the video output. The only way too have a 5v only voltage input is with F18a. A 24AWG wire can carry up to 2A, which is plenty for the CV to handle. Define "fine". What I mean is that you put the meter on AC voltage, then test the voltage rails with the system turned on. Any reading above 0.1V is a potential concern. 24AWG should be able to handle up to 2A, so that's plenty good for CV use. Do you use flux? You should definitely use flux. Also, clean the solder tip before attempting to solder. Minimize the amount of solder you use. Wick away the extra. Then when attaching the wire, use flux. Did I mention that you should use flux? Just doing that will give you a joint that almost looks like it came from the factory. Yes, solder contains a tiny amount of flux. But if you've taken too long to solder (like, more than a couple seconds), the flux will have vaporized and left you with only a blob of metal that wants to invent new shapes and create weak bonds. Also, flux helps to deoxidize the metals that you want the solder to stick to. So always have more flux available. Also, place the iron firmly against all surfaces that you want the solder to stick to, all at the same time. Remember that solder chases heat. Depends. The 5-11Under Mod takes its video inputs directly from the VDC, skipping all of the 12V electronics in the modulator, and is powered by 5V. The only remaining need for 12V is when you're using the Atari module, because the Mod still takes the composite from after the analog switch. Ah, I understand now. Testing the rails sometimes resulted in 0.4-0.5 when the meter was on the 200V AC setting, but I couldn't get it to consistently show above 0.0. I bought some 20AWG solid for .40 at the local hardware store, just to be thorough. Come on. Gimme some credit. And yes, I thoroughly clean it when done. 91% IPA and an acid brush. The 5-11Under Mod takes its video inputs directly from the VDC, skipping all of the 12V electronics in the modulator, and is powered by 5V. The only remaining need for 12V is when you're using the Atari module, because the Mod still takes the composite from after the analog switch. This is where I think I'm now at a crossroads. I rewired the switch again, pin to pin, using the 20AWG wire, quadruple-checking for stray traces. Same result as with the 4-pin method: off when off, less than stellar signal when on. I then decided to put my suspicion to the test. With the switch in the off position, I took a small piece of wire with my tweezers and touched the 3 pin to L6 to short the 5V connection to "on". Lo and behold, I got the perfect signal once again. So I'm left with two possible conclusions. One: the problem is with the 12V connection--possibly AC noise. Two: it's the new switch. I can make sure everything's clean and properly greased on the new switch, but what should I do if it's the other problem? New PSU? It's weird that you can't get a consistent reading, but yeah 0.4V is like 8% ripple, which is rather poor. It is possible that the power supply needs new caps. This is something you'd want to fix sooner rather than later, because failed power supplies can sometimes send too much voltage. You can always get the USB power adapter that Dragonbox came up with instead too. It seems to work well. That's good. With the discussion about lifted traces and odd shaped solder blobs, I was concerned. So with only the 5V power, you get a good system then? Easy way to eliminate the switch as the culprit: Only hook up the 5V side. From what you describe above, it seems to be the 12V rail that's adding noise. First of all...damnedest thing. The fiberglass board of the switch cracked right in half. The new switch, mind you. Apparently they're not made as durable now as in 1982. So I had to test with the "skates" loosely on top of the pins, sliding them carefully back and forth for on and off. The result: I achieved the perfect signal I've been chasing. With a broken switch. *sigh*. I'll pick another up from the store tomorrow and try it one more time, this time greasing it without taking it apart (there's a little bit of space to get some in). If that doesn't do the job (and probably even if it does), I'll end up getting a rocker switch; I'd like to keep the switch looking as close to OEM as possible, but whaddya gonna do, right? Edited by HeadcolorsTV, Thu Apr 11, 2019 6:43 PM. Went ahead and ordered one of those Radio Shack DPDT rocker switches, installed it. I'm still getting signal noise. After a few minutes of playing, it does seem to decrease significantly. But after powering off and then on, it returns. I played Ladybug for a good ten minutes, then turned it off, and switched to Gorf. Powered on, signal noise... and then at the BIOS screen, the signal began to slowly pull and tear. That's really the only way I can describe it; imagine you took a screenshot in Photoshop and used the smudge tool and just swiped a few times. Over time, it got a little worse. Unplugged the power for a few moments, then plugged it back in and powered it on. Signal noise still, but no pulling & tearing. I'm guessing it happens after it's been used for awhile. So you very well might be right about a capacitor going bad. Is this also a symptom of AC voltage noise? And will replacing the PSU with one of those USB-C adapters be the final fix? I feel like it HAS TO BE. Edited by HeadcolorsTV, Mon Apr 15, 2019 6:57 PM. When you see the signal getting bad, try taking an AC voltage reading of that 12V rail (and 5V for that matter). If it's the presence of ripple in the line that's causing problems, it ought to be easily evident on your meter then. Again, looking for a constant reading above a couple tenths of a volt. But if not, then there may be something in what's left of the RF system that needs to be addressed. Also, try without the 12V hooked up, since that seems to have worked at least once. I went through everything, including the mod, making triple-sure there wasn't any excess flux in the tighter areas, going over joints thoroughly with the IPA. Tested again, same result, no measured AC ripple, but I can HEAR AND SEE IT. I accidentally bumped the PSU plug (to console) with my hand. AND IT REPLICATED/AMPLIFIED THE PROBLEM. Eureka. There's something loose/broken inside either the plug connector or just before it in the cable. This whole time, I've always been so careful and precise when plugging the power supply into the CV that I didn't give that possibility a thought. Go figure. After some Deoxit and adjusting the pressure of the connector to juuuuuust the right spot (+/- 1mm, lol), I'm able to get the signal about 95% perfect. Very faint hum and rolling static over an otherwise crystal-clear image. I'm definitely investing in a ColUSB this weekend, which should indeed solve the problem once and for all...and thus end my three-year adventure of chasing a perfectly-working CV. The plug issue could have been part of your woes with the original switch as well. I have a rocker switch installed in mine and it works great. But prior to that I found that even cleaning the original switch was quite hit n miss. It wasn't until I replaced the switch with a rocker and then noticed I would still occasionally get garbled graphics (I have the +5 ram mod on mine as well), that I suspected something else. Sure enough if I touched the plug connect going into the CV I found that the glitches etc would go away. I still use the original PSU but I have "reformed" the pins on the mail connector side of the CV so it all seats better. I do have one of the ColUSBs at the ready as well just in case. It's also useful to take a close look at the CV side of the plug. Are any of the pins wobbly? On the back side, does it look like the rivets are relaxing their hold? Do the wires move? By "reformed," what do you mean? At first I thought they were cylindrical C-shaped pins that I could bow out a tiny bit, but on mine they appear to be solid pins. Zero wobble, and the rivets are nice and snug against the fiberglass piece on the receptacle. You should also check the pins in the power plug. Sometime the pin sleeves get loose and you need to tighten them by bending them in a little bit. What's the best method of getting in there to do so? I have really fine tweezers, but I'm doubting they'll be able to bend much once they're in there. I think I have seen people use a pick tool. I know RuggersCustoms had a picture showing what to do, but I can't seem to find it at the moment. Edited by Bmack36, Thu Apr 18, 2019 9:46 AM. I wasn't able to get anything into the connector to where I could adjust the pin sleeves, and they looked plenty closed. So what I did was flux the terminals connected to the rivets at the receptacle (console-side), and soldered a tiny bit where the stranded wires were crimped to each. I then reapplied Deoxit to the plug, this time spraying a good amount right into each pin sleeve. I'm happy to report 100% optimal picture and sound with zero noticeable hum and no perceptible rolling static. The colors are at their most vivid. It's the best possible output one can ask from the original hardware. I already ordered the ColUSB earlier today, but I don't think I'll cancel the order. Instead, I'll probably use the ColUSB and keep the original PSU stored away safely as a backup. Or as a novelty of technologies past...because damn. Look at that thing. Some day in the near future, I hope to construct a thread dedicated to teaching other CV owners what to look for, based on my own experiences and trials-by-error with this console of mine. The ColUSB is still a worthy investment. Eventually something (most likely the capacitors) in your PSU will die. It's worth it to have a back up on hand. Or use it as the primary going forward. And while the caps (or other parts) can be replaced, it's a pain as you have to cut the PSU open, then glue/epoxy it back together. Edited by nick3092, Thu Apr 18, 2019 5:51 PM.